This beautifully decorated lobby offers a variety of seating areas and a wonderful water feature. The spacious suite-style rooms offer two work areas and ample seating for multiple guests. The location is excellent, whether you're in town for business or college activities. Smoke free premises. 208 units. 11 stories, interior corridors. Accessibility (Call). I-40 exit 209, 0.5 mi sw. 1811 Broadway 37203.
refrigerators, microwaves, coffeemakers, high-speed Internet, wireless Internet, safes. 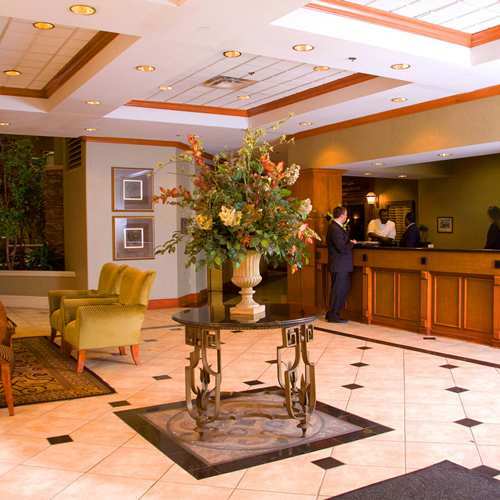 valet and coin laundry, boarding pass kiosk, room service, area transportation-within 2 mi. check-in 4 pm, 1-7 night minimum stay, cancellation fee imposed.